Arild, Jon and Jan had grownup playing jazz. They had been members of various quartets. Terje hoever, was a relative newcomer to jazz. He only started playing in 1968. Previously, he’d played in rock bands. Stylistically, this was a whole new ball game. However, after a year playing jazz, he was hooked and became a member of The Esoteric Circle. 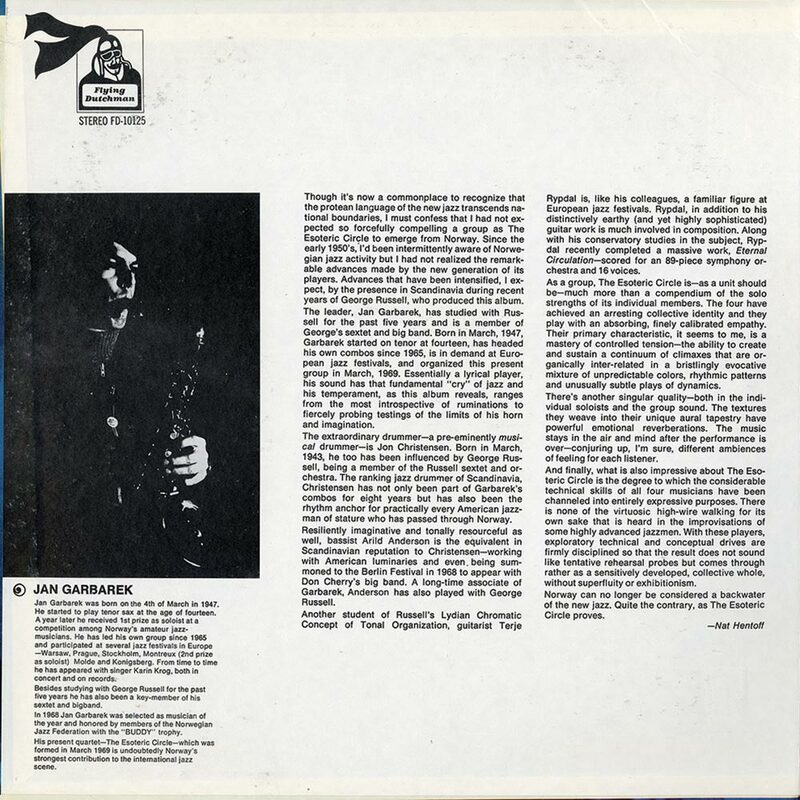 Jan Garbarek was fourteen when started to play tenor sax. He was a natural. A year later, he won first prize in the soloist category, for Norwegian Amateur jazz musicians. It seemed, Jan was destined to make a career out of music. By 1965, Jan had his own group. They played at jazz festivals across Europe. This included Prague, Stockholm, Warsaw, Molde, Kronisberg and the prestigious, Montreux Jazz Festival. Jan also accompanied Karin Krog live and on record. During this period, Jan got the opportunity to study under a jazz legend, George Russell. George Russell had made Oslo his home. Like many American jazz musicians, he made Europe his adopted home. That’s where he taught the Lydian Chromatic Concept Of Tonal Organisation. Jan spent five years studying a theory that Miles Davis and Eric Dolphy pioneered. As well as studying with George Russell, Jan played in his sextet and big band. The other thing George Russell was responsible for, was bringing together The Esoteric Circle. Terje Rypdal, Jon Christensen and Arild Andersen and Jan all met through George Russell. Guitarist Terje Rypdal originally played in rock bands. He was a member of Norway’s most popular pop group, The Vanguards. He then joined progressive rock and blues group Dream. By 1969, he was also a student at the Conservatory of Music. A gifted student, Terje had just written, Eternal Circulation a symphony for an eighty-nine piece orchestra and and sixteen vocalists. He’d also played on George Russell’s Electronic Sonata For Souls Loved By Nature. This was just part of the Terje Rypdal story. Having turned to jazz, Terje played at festivals across Europe. His background was similar to Jan. Terje played at Stockholm, Bologna, Molde and Kronisberg. Then at Badden Baden, Terje joined a group of pioneering jazz musicians, including John Surman, Roscoe Mitchell and Lester Bowie. They dipped their toe into the waters of free jazz. This wouldn’t be the last time. Before Jon Christensen joined The Esoteric Circle, he’d been a session musician. He was the most sought after session drummer in Norway. Before long, his talents were in demand all over Scandinavia. Especially, among visiting American jazz musicians. They wanted Jon providing the heartbeat. There was more to Jon than a session musician. Jon had been part of George Russell’s sextet and big band. He also was a member of the Steve Kuhn Trio, and played many jazz festivals. This included Bologna, Stockholm, Warsaw, Molde, Kronisberg and Montreux. Somehow, Jon also found time to play on two albums by Karin Krog. A talented and sought after musician, it’s no surprise, that Jon won the Buddy Award for Norwegian musician of the year in 1967. Two years later, another future member of The Esoteric Circle would win the Buddy Award. This was bassist Arild Andersen. He’d played alongside Jon many times, including when visiting American jazz musicians arrived in Norway. Jon and Arild were part of Karin Krog’s. They also played at the same festivals, including Bologna, Stockholm, Molde and Kronisberg. However, Arild would play alongside another future member of The Esoteric Circle. Arild played alongside Jan Garbarek. Their paths crossed in the mid-sixties. That’s not surprising. The Oslo jazz scene was relatively small. On other occasions, Arild accompanied George Russell and in 1968, The Don Cherry Big Band. A year later, Arild won the Buddy Award for Norwegian musician of the year in 1969. This was an important year for Arild. It was the year The Esoteric Circle was founded. Having founded The Esoteric Circle in 1969, they entered the Henie-Onstad Kunstsenter, recording studio in Oslo in October 1969. The rhythm section of bassist Arild Andersen, drummer Jon Christensen and guitarist Terje Rypdal were augmented by tenor and soprano saxophonist Jan Garbarek. 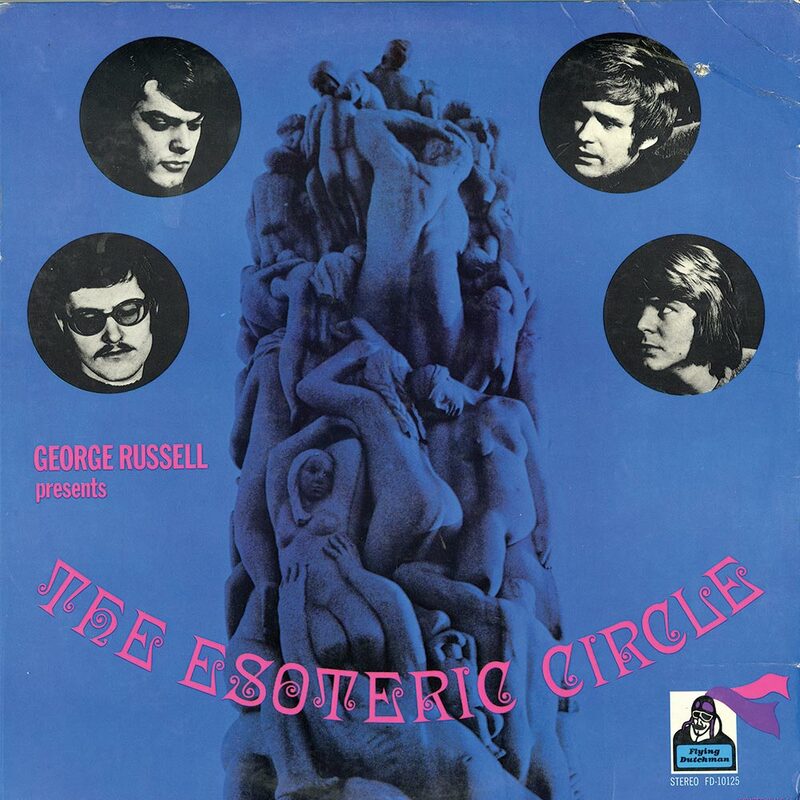 George Russell produced George Russell Presents The Esoteric Circle. It featured nine tracks. Seven were penned by Jan Garbarek. The other two, Nefertite and Breeze Ending were cover versions. These nine tracks, became George Russell produced George Russell Presents The Esoteric Circle. 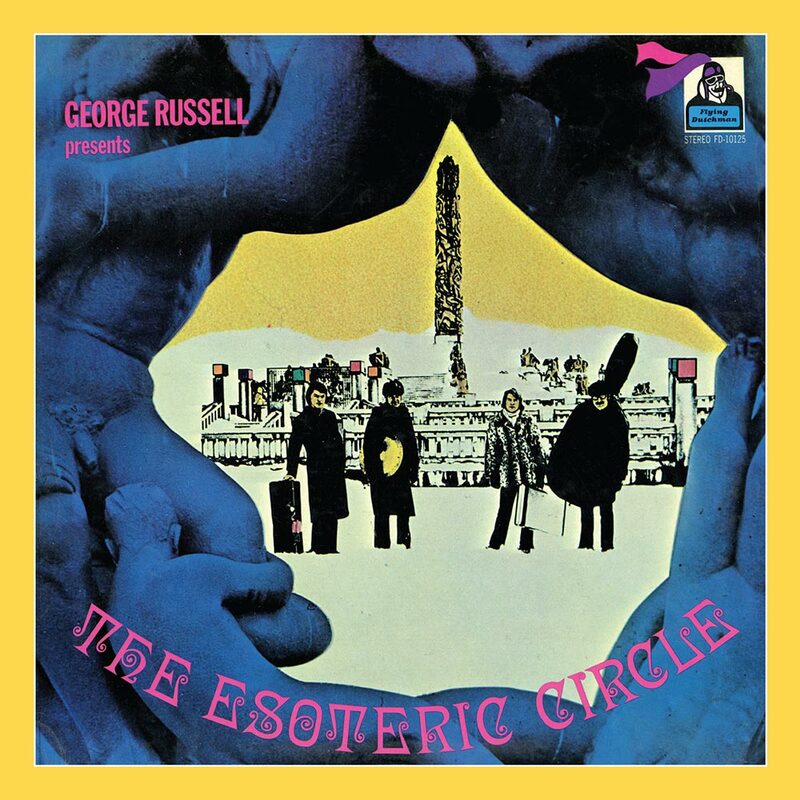 It wasn’t until 1971 that George Russell Presents The Esoteric Circle was released. 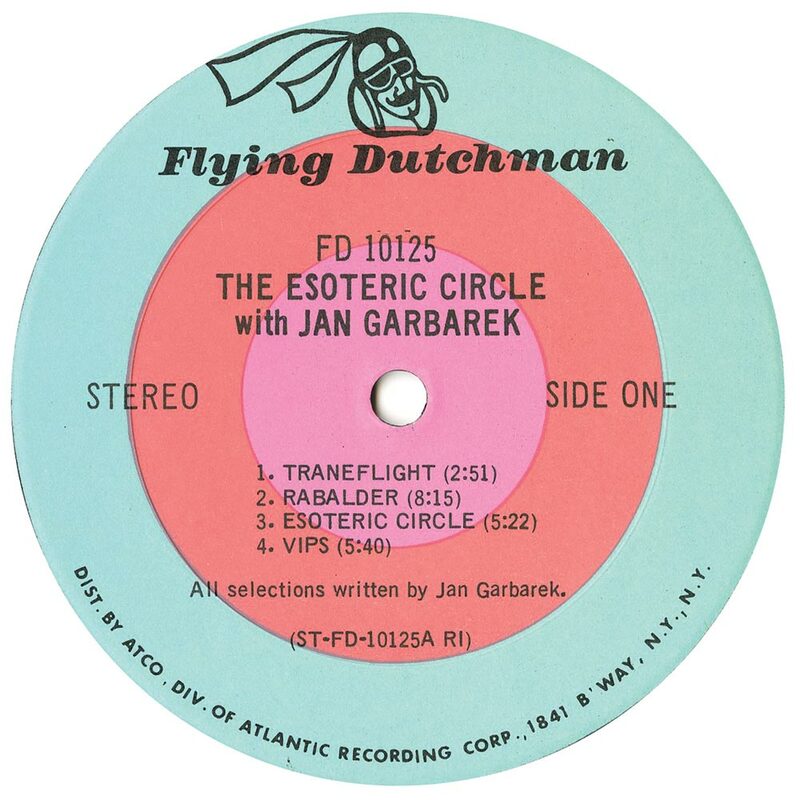 Two years passed before Bob Thiele released George Russell Presents The Esoteric Circle on his Flying Dutchman Productions’ label. It was well received within jazz circles, and perceived as an important, ambitious, pioneering and genre-melting album. Sadly, it wasn’t a commercial success. As a result, George Russell Presents The Esoteric Circle was The Esoteric Circle’s only album. However, what a musical legacy it is. The sultriest of saxophone and wistful, dramatic guitar combine on Traneflight, which opens George Russell Presents The Esoteric Circle. Percussion plays, as the rhythm section slowly join in. All the time, the music is tinged with sadness, melancholia and drama. Jazz’s past, present and future combines. Happily, the old and the innovative sit side-by-side on this beautiful, wistful track that’s designed to tug at your heartstrings. Drums roll and pound on Rabalder. It’s as if drummer Jon Christensen is setting the scene for the rest of The Esoteric Circle. He showcases his considerable skills, making his way round the kit. His playing is flawless, as he showboats his way round his kit, showing why he was one of the best drummers in Scandinavia. Eventually, the rest of The Esoteric Circle enters. A braying, howling horn, chiming guitar and subtle bass combine. It’s the frenzied saxophone and drums that take centre-stage. The rest of The Esoteric Circle are almost playing supporting role. Again, the track heads in the direction of free jazz. Later, a searing guitar is unleashed, as if if The Esoteric Circle are drawing inspiration from John McLaughlin. Rock meets free jazz and jazz, on a truly groundbreaking track. Just a bass and subtle cymbal open Esoteric Circle. When, The Esoteric Circle enter, they sound like a band from jazz’s golden age. They play within themselves, producing a late night, smoky sound. Partly, that’s down to the saxophone. Sometimes, it’s akin to a cathartic outpouring of hurt. All the time, the arrangement marches to the tune of Arild Andersen bass. He and drummer Jon Christensen anchor a track where jazz’s past and present combine seamlessly, producing a laid-back slice of jazz. Thoughtfully, and pensively Vibs, unfolds. Just the bass plays. Soon, the drums join. Eventually, a scrabbling saxophone enters. It injects a sense of urgency. So does the driving, dramatic guitar. Again, there’s a nod to John McLaughlin, in the way jazz and rock are combined by guitarist Terje Rypdal. The rest of The Esoteric Circle combine avant-garde, jazz, experimental and free jazz. It’s a compelling fusion of influences, that was way ahead of its time. So much so, it’s hard to believe that such a groundbreaking track as Vibs, was recorded in 1969. Sas 644 is an eight minute epic. 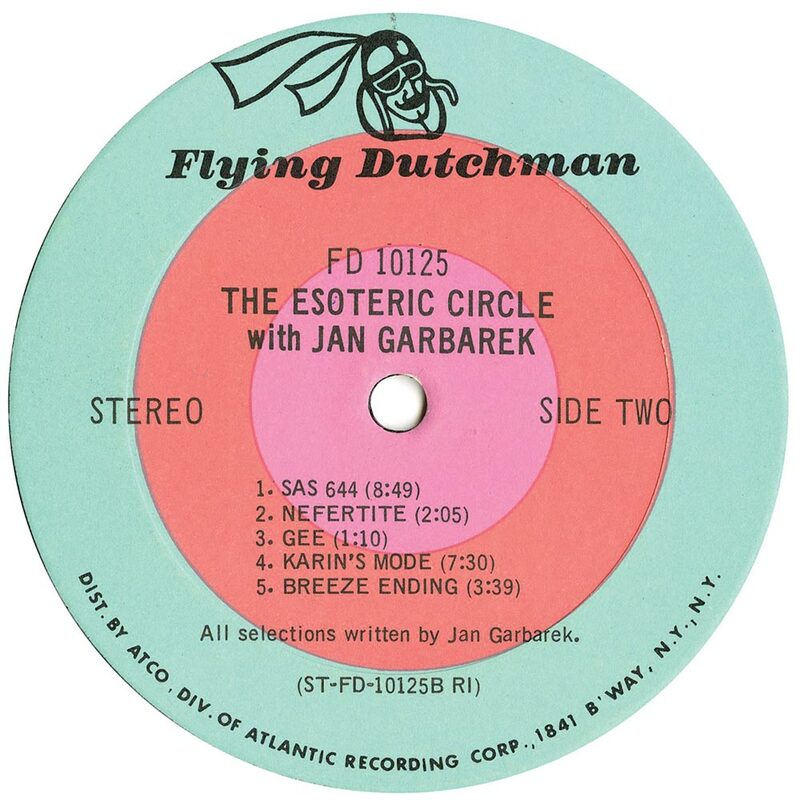 This allows The Esoteric Circle to explore the track’s nuances and subtleties. The rhythm section of bassist Arild Andersen and drummer Jon Christensen combine. Jon works his way round the kit, and with Arild Andersen’s bass, drive the arrangement along. Soon, Jan Garbarek’s saxophone and Terje Rypdal’s choppy guitar licks enter, adding urgency and drama. That’s not all. They signal The Esoteric Circle to cut loose. Terje uses a myriad of pedals and effects, mangling the sound. His guitar wah-wahs and wails, as The Esoteric Circle veer between fusion and free jazz. Jan seems to be inspired by Terje. He makes his saxophone howl and wail. Other times it brays and blazes. Later, the rhythm section accompany Jan’s allowing him to take centre-stage, but sometimes, showcasing their considerable talents. Just a hauntingly beautiful saxophone solo and deliberately strummed guitar combine on Nefertite. Occasionally, the bass wails and a cymbal crashes. Mostly the music is hauntingly beautiful, and a tantalising taste of what The Esoteric Circle are capable of. Gee is best described as an ambitious melange of avant-garde, experimental and free jazz. It veers between ambitious, challenging, discordant and innovative. A thoughtful, mesmeric bass gets into a groove on Karin’s Mode. Gradually, distant drums, a subtle, braying saxophone and wailing guitar combine. Terje unleashes his array of pedals and effects. The result is futuristic and funky. Not to be outdone, saxophonist Jan Garbarek makes his saxophone bray, blaze and wail. It’s as if The Esoteric Circle are improvising. They encourage each other to experiment and push musical boundaries. The status quo isn’t an option, as they unleash a groundbreaking, futuristic, eight minute epic that forty-five years after it was recorded, is truly mesmeric. Closing George Russell Presents The Esoteric Circle is Breeze Ending . Just a lone saxophone skips across the arrangement. It’s very much a showcase for saxophonist Jan Garbarek. The rest of The Esoteric Circle only make an appearance after two minutes. Drummer Jon Christensen and bassist Arild Andersen, combine. 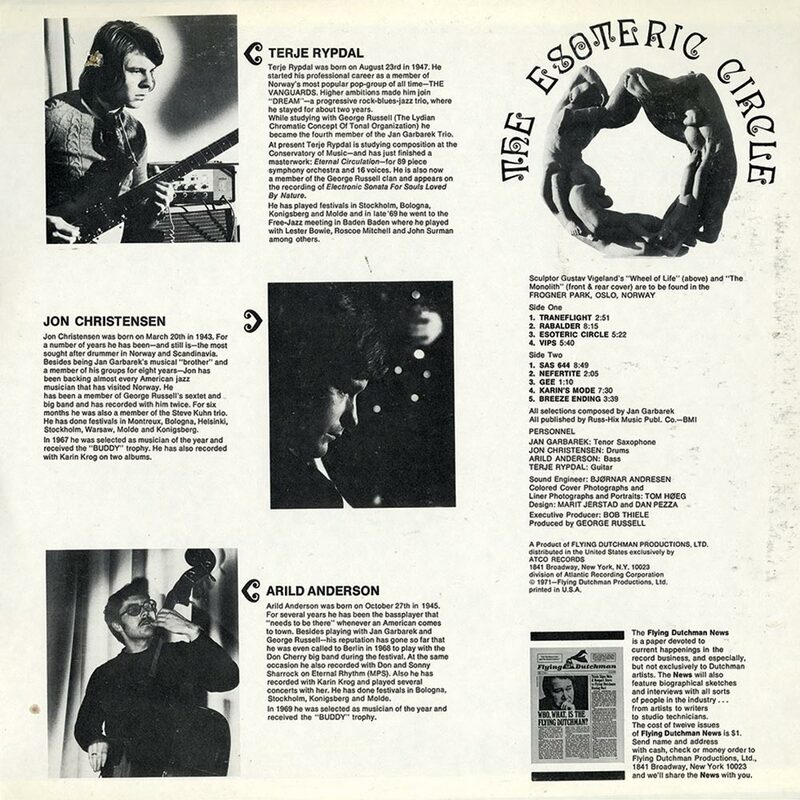 Then guitarist Terje Rypdal enters, and the track takes on a much more uplifting sound, and is a joyful, hopeful way to close George Russell Presents The Esoteric Circle. Two years the recording of George Russell Presents The Esoteric Circle in Norway, in 1969, it was eventually released on Bob Thiele’s Flying Dutchman Productions in 1971. At last, The Esoteric Circle’s one and only album was heard by a wider audience. When George Russell Presents The Esoteric Circle was released, it was well received by critics. They hailed it one of the most important album in European jazz history. Sadly, this critical acclaim didn’t translated into sales. George Russell Presents The Esoteric Circle wasn’t a commercial success. The problem was, here was an album that was way ahead of its time. Listening back to George Russell Presents The Esoteric Circle, it could easily be an album that the latest generation of Norwegian jazz musicians could’ve released. Norwegian music, including jazz, is enjoying another golden age. So much good music is coming out of Norway. That was the case back in 1969, when George Russell Presents The Esoteric Circle was recorded. By 1971, Norwegian music was still thriving. Fast forward forty-three years, and George Russell Presents The Esoteric Circle is an album that has obviously influenced a new generation of Norwegian jazz musicians. Without George Russell Presents The Esoteric Circle, the latest generation of Norwegian jazz musicians may not have had the courage to innovate, and create bold, ambitious, groundbreaking and genre-melting music. Thankfully, they do. That in part, is down to five men, George Russell and The Esoteric Circle. They played their part in an important, innovative and groundbreaking album George Russell Presents The Esoteric Circle, which was recently released by BGP Records, an imprint of Ace Records. ← GIL SCOTT HERON-FREE WILL.